Vaults are evolutionary highly conserved ribonucleoproteins particles with a hollow barrel-like structure. The main component of vaults represents the 110 kDa major vault protein (MVP), whereas two minor vaults proteins comprise the 193 kDa vault poly(ADP-ribose) polymerase (vPARP) and the 240 kDa telomerase-associated protein-1 (TEP-1). Additionally, at least one small and untranslated RNA is found as a constitutive component. MVP seems to play an important role in the development of multidrug resistance. This particle has also been implicated in the regulation of several cellular processes including transport mechanisms, signal transmission and immune responses. Vaults are considered a prognostic marker for different cancer types. The level of MVP expression predicts the clinical outcome after chemotherapy in different tumour types. Recently, new roles have been assigned to MVP and vaults including the association with the insulin-like growth factor-1, hypoxia-inducible factor-1alpha, and the two major DNA double-strand break repair machineries: non-homologous endjoining and homologous recombination. Furthermore, MVP has been proposed as a useful prognostic factor associated with radiotherapy resistance. Here, we review these novel actions of vaults and discuss a putative role of MVP and vaults in the response to radiotherapy. Vaults are ribonucleoprotein particles with a hollow barrel-like structure  and a mass of 13 MD. In mammals, it is composed of three proteins: MVP (104 kD), the vault poly(adenosine diphosphate-ribose) polymerase also known as VPARP (193 kD), and telomerase-associated protein-1 TEP1 (240 kD), and small untranslated RNA (vRNA) of 141 bases. MVP constitutes more than 70% of the total mass of the complex [2–4], while vARN represents less than 5% . The molecular architecture of the rat liver vault complex was recently elucidated at high resolution . A vault consists of 2 dimers of half-vaults, which align at their waists to form together a barrel-like structure with the overall dimensions of 72 × 41 × 41 nm. Each half-vault comprises 39 identical major vault proteins (MVP), the major self-assembling structural component (Figure 1). Interestingly, vaults can open, the two halves can dissociate at their waists at acidic pH, and half vaults can be exchanged to form new vaults. Based on these features and on its large interior volume, which may encapsulate hundreds of proteins, recent interest in recombinant vaults derives from nanoparticle research trying to exploit vaults as drug delivery system [7, 8]. Overall structure of the vault shell. One molecule of MVP is colored in tan, and the others are colored in purple. (Left) Side view of the ribbon representation. The whole vault shell comprises a 78-oligomer polymer of MVP molecules. The size of the whole particle is ~670 Å from the top to the bottom and ~400 Å in maximum diameter. The particle has two protruding caps, two shoulders, and a body with an invaginated waist. Two half-vaults are associated at the waist with N-terminal domains of MVP. (Right) Top view of the ribbon representation. The maximum diameter of the cap is ~200 Å. 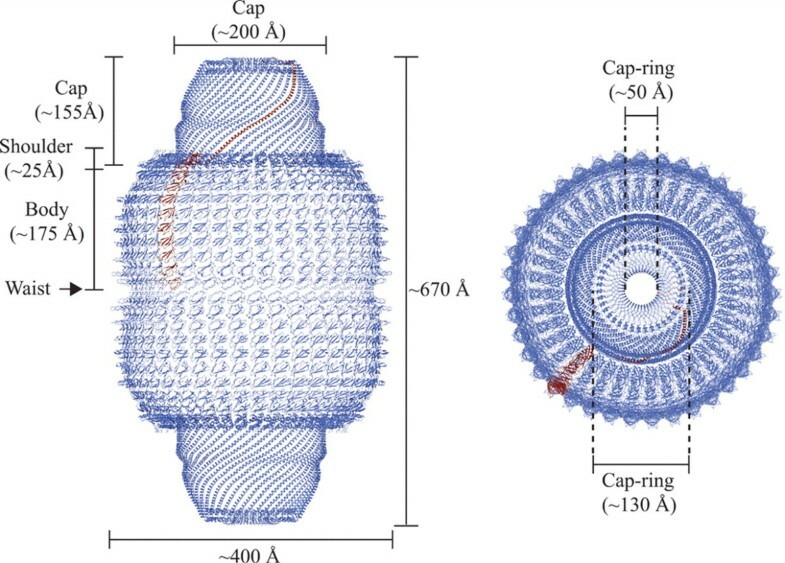 The outer and the inner diameters of the cap-ring are shown. Figure reproduced from Tanaka et al. (2009) with permission from The American Association for the Advancement of Science (Sciences Magazine). The sequences of the 2 other proteins, which are not part of this shell-like structure and probably reside at the top center of the caps or within the vaults, are identified and are present also in the human genome. VPARP presumably ribosylates substrates and TEP1 is important for stabilization of vRNA. Molecular composition of the vault has been roughly estimated as 78-96 MVPs, eight VPARPs, two TEP1s, and at least six copies of vRNA . Both the high degree of evolutionary conservation and the complex structure of vault particles, as well as its broad distribution in tissues, suggest an important function in cellular processes . Although vaults have been proposed to play a role in drug resistance, nucleocytoplasmic transport, and regulation of signaling, a definitive function for MVP or vaults has yet to be assigned as MVP knockout mice (MVP-/-) do not have phenotypes consistent with these in vitro observations . This suggests that even though the major component of the vault particle is absent in MVP-/--mice, and vault particles are no longer detected, the remaining components TEP1, VPARP, and vRNA might still interact and possibly fulfill a functional role. The human gene encoding MVP has been located in chromosome 16 (16p11.2) , approximately 27 cM proximal to the gene location of the multidrug resistance protein-1 (MRP1, also designated as ABCC1) . However, although both the ABCC1 and MVP maps to the short arm of chromosome 16, they are rarely coamplified and are normally not located within the same amplicon and can be switched on separately [12, 13]. Analysis of the human MVP gene revealed a TATA-less promoter, which also lacks other core-promoter elements but harbors several putative transcription factor binding sites, including an inverted CCAAT box, a p53-binding site, and a GC box element . In silico analysis identified a putative STAT-binding site that strongly resembles an interferon-γ-activated site element (GAS), which binds preferentially to STAT1 homodimers . Disruption of the STAT-binding site reduces basal MVP promoter activity, suggesting a role of JAK/STAT signals in the activation of MVP expression . With up to 105 particles per cell, vaults are abundantly present in many different cell types, although its expression varies among tissues. Vaults are most numerous in macrophages [17, 18] and epithelial cells with secretory and excretory functions as well as cells chronically exposed to xenobiotics such as bronchial cells and cells lining the intestine . Most of the vaults are located in the cytoplasm, although a small fraction of these particles apparently is also localized at or near the nuclear membrane and the nuclear pore complex [20, 21]. The widespread of vaults in many diverse organisms and cell types suggests that their function is essential to eukaryotic cells. The detailed insight on the structure of MVP and vaults contrasts with the poor understanding of their endogenous function. Several observations though indicate that MVP is directly involved in major cytoplasmic signal transduction cascades. In EGF-stimulated cells, tyrosine-phosphorylated MVP complexes with the SH2-domain-containing tyrosine phosphatase SHP-2 and interacts with ras-activated downstream kinase Erk, presumably to fine-tune the activity of the Erk-downstream target Elk-1 . But tyrosine-phosphorylated MVP also binds to the SH2-domain of Src-kinase and downregulates EGF-dependent ERK activation in Src overexpressing cells . Likewise MVP also binds to the tumour suppressor phosphatase and tensin homolog deleted on chromosome 10 (PTEN) and a significant quantity of endogenous PTEN associates with vault particles in HeLa cells, thus suggesting a regulatory role for MVP in the phosphoinositide 3-kinase/Akt (PI 3-kinase/Akt) signaling pathway . However, MVP-PTEN-interaction might only be relevant for nuclear import of PTEN thereby regulating the nuclear function of PTEN (, see below). Eventually, the identification of the specific growth factor-regulated MVP phosphorylation sites and the complexed interaction partner on MVP in response to growth factor stimulation are required to reveal a scaffold or direct regulatory function of MVP/vaults on these signal transduction cascades. Likewise, a co-immunoprecipitation approach revealed that the UV-induced phosphorylation status of MVP affects the capacity of the constitutive photomorphogenic 1 ubiquitin ligase (COP1) to interact with the transcription factor c-jun. In unstressed cells, cytoplasmic MVP/vault binds to and modifies COP1, presumably via the other vault components. Following shuttling into the nucleus, COP1 complexes with c-jun with high affinity and suppresses its transcriptional activity by targeting c-jun for degradation. After UV irradiation, phosphorylated MVP does not interact with COP1 anymore, eventually leading to the alleviation of COP1-c-jun- complex formation. Free c-jun subsequently drives AP-1-controlled gene expression . Negative regulation of downstream signaling has also been identified on the level of the hypoxia-inducible factor-1α (HIF-1). HIF-1α and MVP-expression are increased under hypoxia. However, the stability of HIF-1α protein is enhanced to higher extents in MVP-knockdown cells. Direct complex formation of vaults with HIF-1α, PHDs and pVHL was demonstrated and suggests that MVP/vault might act as scaffold protein for ubiquitination and degradation of HIF1α  and thereby affects hypoxia-regulated expression of HIF-1α-dependent gene expression. The generation of MVP-/--mice did not reveal any further indications on an essential role of MVP and vaults during embryogenesis and in the cellular processes in tissues of adult mice under normal environmental conditions. Furthermore, both embryonic stem cells and bone marrow cells derived from MVP-/--mice display a similar sensitivity towards classic cytostatic agents as their wildtype counterpart cells, and normal tissue toxicity towards doxorubicin in vivo is unchanged in the MVP-deficient mice. Interestingly though and unexpectedly identified, MVP and vaults are part of the effective innate immune response and contribute to the uptake and clearance of lung pathogens such as Pseudomonas aeruginosa via lipid rafts in lung epithelial cells, and eventually resistance to lethality . Furthermore, the activation of MVP-expression by interferon γ through the JAK/STAT pathway and enhanced expression of MVP in macrophages and in dendritic cells suggest a clear relationship with the immune system [16, 29]. However, despite the high abundance of MVP/vaults in MVP-wildtype dendritic cells, no differences in dendritic cell migration and antigen presentation and T-cell responses could be observed in MVP-/--mice. In human beings, a strong up-regulation of vault expression during dentritic cell culturing was observed, proposing that vaults act as components in the cascade of events regulating dentritic cell effector function . Besides the activation of MVP by interferon, several other observations indicate that MVP might be involved in immunological responses . It has been reported a dramatic induction of vRNA expression in response to infection with Epstein-Barr virus [32, 33], and vRNA induction has been has been suggested as playing important roles in innate immunity . This led to speculate that vRNA/vaults could be involved in anti-viral defence. Finally, the hollow structure, the rapid movements, the distinct subcellular localisation (as for example at the nuclear membrane), and the in vitro and clinical correlations with drug resistance in several types of human cancers led to the hypothesis that vaults might represent rather promiscuous transport vehicles [35–37]. The MVP has originally been identified as the lung resistance protein . LRP was discovered almost 20 years ago as a protein overexpressed in a multidrug-resistant lung cancer cell line diverting cytostatic drugs from intracellular targets and conferring multidrug resistance (MDR) . Several proteins have been linked to MDR, such as the ABC-drug transporter p-Glycoprotein (P-gp, also designated as ABCB1), members of the multidrug resistant protein family (ABCC1, ABCC2, ABCC3), the human breast cancer resistance protein (BCRP) and the lung-resistance protein (LRP) [36, 38, 39]. The LRP was initially discovered due to its high expression level in a multidrug-resistant but ABCB1-negative lung cancer cell line  and has been identified in 1995 to be the human major vault protein . Thereby, a first link between the MDR and vaults was established. MVP has been detected in 78% of 61 human cancer cell lines, and its expression levels correlate with resistance against a variety of MDR-related and unrelated drugs [40, 41]. Furthermore, upregulation of the MVP expression level was determined in multiple human cancer cell lines also on treatment with anticancer agents, including anthracyclins, etoposide and cisplatin, further supporting a putative link between treatment sensitivity and cellular stress adaptation to cytotoxic agent [19, 42–47], and overexpression of MVP is also frequently observed at the early steps of resistance selection [45, 46, 48, 49]. Multiple preclinical studies have corroborated this link between MDR and the MVP expression level in cancer cells, despite some contradicting studies and the fact that the MVP knockout mouse does not show enhanced hypersensitivity to cytostatics. However, this might be due to differential cancer to normal cell line treatment sensitivities or the upregulation of other ABC-transporters or unknown mechanisms of MDR on disruption of functional MVP [11, 50]. Vaults may mediate multi-drug resistance by the transport of drugs away from their subcellular targets, by the extrusion from the nucleus and/or the sequestration of drugs into exocytotic vesicles. Either through these exocytotic vesicles or pump molecules like ABCB1, ABCC1, or breast cancer resistance protein at the plasma membrane, the intracellular potency of these cytotoxic agents will be reduced . Alternatively, the two vault-associated VPARP poly(adenosine diphosphate-ribose) polymerase or TEP-1 may fulfil a protective function of the genome and thereby contribute to a drug-resistance profile. Concomitant operation of several drug resistance mechanisms may often be necessary to cause the phenotype of MDR, and co-expression of MVP and ABCC1 frequently occurs and associates with increased drug resistance levels in MDR-selected tumour cells . Interestingly, up-regulation of MVP could be linked in a series of MDR cell lines with a low and intermediate level of drug resistance with subsequent up-regulation of ABCB1 leading to high levels of drug resistance. These findings point the MVP expression level as a marker for low level of drug resistance, which is clinically more relevant [19, 45, 48]. Furthermore, several studies reported that the expression of MVP is a predictive marker in several tumour types for the response to chemotherapy [52, 53]. Interestingly, human vRNAs produce several small RNAs (svRNAs) by mechanisms different from those in the canonical microRNA (miRNA) pathway. svRNAb downregulates CYP3A4, a key enzyme in drug metabolism. This finding contributes to understand the role of vaults particles in drug resistance, proposing a novel function to vRNAs that may help explain this association . In recent years, several findings indicate a link between MVP and vaults not only to drug-resistance based on its putative drug-exporter function, but also to DNA-damage and DNA-damage-repair. MVP transcription and protein levels are increased in response to various DNA-damaging agents, including ionizing radiation (IR) . Interestingly, VPARP and, to lesser extent, TEP-1-deficient mice, have an increased incidence of carcinogen-induced colon tumours . These findings indicate that vaults may play a role in facilitating DNA repair processes. The high cytotoxicity of IR is mainly based on its ability to induce DNA double strand breaks (DSB) via generation of reactive oxygen species. DSB can be repaired by the two major DSB repair machineries: homologous recombination (HR) and non-homologous end joining (NHEJ). The fact that error-free repair by HR depends on the presence of an intact sister chromatid restricts this pathway to occur during S and G2 phases of the cell cycle. This is, in contrast to error-prone repair by NHEJ which can function throughout the cell cycle and is therefore thought to be the predominant DSB repair pathway in mammalian cells. On the other hand, HR represents the more interesting target to sensitize specifically tumor cells to DNA damaging agents leading to an enhanced therapeutic window. MVP and vaults have recently been linked to both major DSB-machineries. Ku70 and Ku80 are key proteins in NHEJ, and also play a strong regulatory role in apoptosis through Bax/Bcl-2 interactions [57, 58]. The DNA end-joining protein Ku70 inhibits apoptosis by sequestering Bax away from the mitochondria. However, newly synthesized Bax undergoes ubiquitination, which negatively regulates its proapoptotic function by labeling it for proteasomal degradation. Interestingly, ubiquitinated Bax associates with Ku70, which mediates Bax deubiquitination, simultaneously generating the active form of Bax but sequestered away from the mitochondria . Low expression level of Ku70 might therefore also result in low expression levels of Bax. On the level of NHEJ, an inverse correlation between high MVP and low expression levels of Ku70/80 and pro-apoptotic bax was identified in a cohort of 160 patients with localized cervix carcinoma. Interestingly, low Ku70/80 expression was also associated with upregulated Bcl-2, altered p53, and increased proliferation in this set of patients . Despite the lack of mechanistic insights these data suggest that overexpression of MVP and vaults might be involved in a carcinogenic process with resultant genomic instability due to suppressed NHEJ. Though enhanced proliferative activity, subsequent tumour progression and enhanced treatment resistance requires at the same time an upregulated apoptotic threshold, which might be activated through the suppression of Bax, upregulation of Bcl-2, mutated p53-status and upregulation of the IGF-1R and downstream signalling cascades. Eventually, only molecular dissection of the key signal transduction cascades leading to reduced NHEJ-activity in MVP-overexpressing and MVP-depleted cells will elucidate the association between MVP/vaults, NHEJ and a deregulated apoptotic threshold. Moreover, MVP increases with age both in vitro and in vivo, and that age-related upregulation of MVP facilitates apoptosis resistance of senescent human diploid fibroblasts based on the interaction with c-Jun-mediated downregulation of BCL-2 . Thus, MVP is suggested to be playing an important role in the resistance of senescent fibroblasts to apoptosis by modulation of BCL-2 expression by JNK pathway, regulating cellular signaling and survival and being a potential therapeutic target for modulation of resistance to apoptosis implicated in aging modulation and cancer treatment . A novel link between the intracellular level of MVP and homologous recombination, the second DNA-DSB-repair machinery, has recently been identified as part of the cellular stress response to ionizing radiation (Presented in ESTRO 29; S 51, 129 oral). MVP-depleted tumour cells are more radiosensitive than their wildtype cognate cells, probably due to direct interference with homologous recombination. In comparison to control cells, Rad51-foci are strongly reduced in irradiated but MVP-depleted cells and thus vaults may coordinate correct HR-complex formation at the site of the DSB. Vaults might also guarantee sufficient protein level of Rad51 required for homologous recombination via coordinated Rad51 expression. It has been reported that MVP mediates nuclear import of PTEN and regulates its nuclear function [24, 62]. Nuclear PTEN expression is high in untransformed cells but decreases with tumour progression. While cytoplasmic PTEN inhibits the phosphoinositol-3-kinase (PI3K)/AKT pathway, nuclear PTEN inhibits phosphorylation of MAPK and consequently reduces the expression of cyclin D leading to a G0/G1 cell cycle arrest. Though, PTEN also acts as cofactor for the transcription factor E2F1, driving expression of RAD51. Cells deficient in PTEN have reduced capacity of homologous recombination-dependent DNA repair, most probably due to reduced levels of RAD51. Thereby, PTEN is also important for the maintenance of chromosomal stability reducing the incidence of spontaneous double strand breaks. Interestingly, loss of PTEN in tumour cells and concomitantly reduced homologous recombination can thereby be exploited by the inhibiton of PARP, creating a situation of synthetic lethality [63, 64]. Since MVP and vaults are involved in nuclear import of PTEN and homologous recombination, it will be of interest to determine whether the MVP expression level also affects genomic instability and sensitivity to PARP-inhibition. Despite the fact that we have so far only limited insights into the mechanisms how MVP and vault interact with the two double strand-break repair machineries, these results indicate that MVP and vaults may co-regulate correct DNA repair of spontaneous and treatment-induced double strand breaks. Due to the barrel-like structure vaults may act as carriers not only for toxic agents but also for the coordinated intracellular transport of DNA-repair related proteins and thereby act as scaffold protein or shuttling vector. Otherwise, the vaults associated proteins VPARP or TEP1 might play a so far not-identified role for correct DNA repair, which could only be achieved as part of an intact vaults. As indicated above, in vitro studies revealed that gene expression levels of MDR-related proteins increased after fractionated irradiation. It is well known that radiation treatment can induce resistance to various cytotoxic drugs , although the molecular basis of this interaction are complex. Irradiated cell lines showed a significant resistance to cisplatin, doxorubicin and bendamustine, suggesting a novel mechanism in the appearance of MDR, which might involve a radiation-induced increment of LRP/MVP . Numerous studies were performed to clarify the expression status of MVP in human malignancies as a predictive and prognostic marker for the chemotherapy response and patient prognosis (Table 1). These studies mainly focused on haematological malignancies. The results should be viewed with caution, since they will be influenced by factors such as 1) MVP detection assays (especially referred to gene expression), 2) number of patients included, or 3) type of statistical analysis performed (univariate vs. multivariate analysis). The quality of MVP as a prognostic or predictive marker in this type of malignancy is still questionable, and standardized detection methods are needed. Nevertheless, a direct association between MVP expression and therapy resistance and prognosis in patients suffering from acute myeloid leukaemia was identified [67–70]. A positive correlation between MVP expression and worse patient prognosis, therapy response, and survival rate has been reported in acute lymphoblastic leukaemia patients [71–73], and similar results have been described in adult T-cell leukaemia [74, 75] and multiple myeloma [76–78]. DFS, disease-free survival; OS, overall survival; NSCLC, non-small cell lung cancer; HNSCC, head-and-neck squamous cell carcinoma. On the other hand, relatively few studies have addressed the role of MVP in solid tumours, with contradictory findings. Thus, the quality of MVP as prognostic marker in ovarian carcinoma is unclear so far, with positive [79, 80] and negative [81, 82] associations reported. Result regarding to breast cancer [83, 84], non-small cell lung cancer [85, 86], or different types of sarcomas are inconclusive [87, 88]. On the other hand, MVP has been established as a reliable factor for response to chemotherapy in bladder cancer patients , melanoma , and determining the aggressive phenotype of testicular germ-cell tumours  and glioblastoma . With regard to a putative role of MVP in radiation resistance, it has been reported that MVP expression is strongly associated with local-disease free survival and cancer-specific survival in a series of patients suffering from squamous cell carcinoma of the oropharynx who received primary radiotherapy with curative intent (in univariate and multivariate analyses) . Elevated MVP expression seems to be associated with a RT-resistant subset of patients, proposing MVP as a novel useful prognostic marker associated with RT . The underlying mechanisms behind this association are not well defined today but might be linked to the above cited role of MVP in DNA repair and apoptotic threshold. The complexity but also interest in MVP as a predictive and/or prognostic marker is also illustrated in cervical cancer patients receiving combined radiochemotherapy . Increased MVP and IGF-1R expression levels were related to a small cohort of cervical cancer patients with reduced long-term local control, in patients who otherwise achieved clinical complete response to radiochemotherapy. High MVP expression was strongly related to high IGF1-R expression, which is associated with chemo- and radioresistance in localized cervical carcinoma patients . This association suggests that both proteins need to be expressed to confer chemoradioresistance in cervical cancer. This was further supported by a subgroup of patients who showed low levels of MVP and IGF1R and who presented excellent survival rates once . All of the responding patients with negative or fairly positive (low MVP) tumours were free of local, distant or death related disease. These results were similar to the ones previously obtained for IGF-1R as a prognostic marker . Combination analysis was performed grouping MVP and IGF-1R expression in tumours, showing that all responding patients with low MVP/IGF-1R tumours were free of local disease, relapse or death related disease. As illustrated by these studies, we are still far away to have identified a mechanistic link between MVP expression level and treatment response, and it is still a matter of debate in how far vaults are involved in chemo- and radioresistance and thus might serve as predictive marker of therapy response. MVP is associated with MDR, and several studies have recognized MVP as a negative prognostic factor for response to chemo- and radiotherapy and/or disease-free survival or overall survival. Molecular, genetic, and clinical data obtained so far warrant further studies into the role of MVP, vaults-related resistance mechanisms. Vaults are ubiquitous ribonucleoprotein complexes involved in a diversity of cellular processes, including multidrug resistance, transport mechanisms, signal transmission and immune response. Nonetheless, new roles have been assigned to MVP in the field of radiotherapy, where vaults have been proposed as a useful prognostic marker associated with radiotherapy resistance. The molecular mechanisms behind this relevant role are unknown, although a possible association with relevant key players in non-homologous endjoining repair and homologous recombination could exist. Additional translational and clinical studies are required to test this hypothesis. We thank Professor Adrian Begg for helpful comments during the preparation of this manuscript. PCL has been involved in revising the manuscript critically for important intellectual content and has given final approval of the version to be published, MP has been involved in drafting the manuscript and has made substantial contributions to conception and design, MZ has made substantial contributions to conception and design, LAHH has been involved in drafting the manuscript and has made substantial contributions to conception and design. All authors read and approved the final manuscript.